Always attention to detail, technical skills, passion in our work and great attention to customer needs are the strengths that have allowed us to excel in the field of sale of AutoAir / Wicked / Createx 4030 INTERCOAT MIX ADDITIVE BALANCING CLEAR 120 ml. Consultando il catalogo di Aerografando you will immediately notice how vast it is and how diversified the model range is Createx auxiliary products, you will find the best AutoAir / Wicked / Createx 4030 INTERCOAT MIX ADDITIVE BALANCING CLEAR 120 ml offers at the best prices on all AutoAir / Wicked / Createx 4030 INTERCOAT MIX ADDITIVE BALANCING CLEAR 120 ml of the brands Createx. Essential additive that enhances spray performance & coating durability. Mix with all Auto Air Colors prior to use. Special mix ratio for candy2o: airbrush – 50% per vol. , spray-gun 50 to 100% per vol. 4030 mixed with Auto Air Colors paint creates an acrylic-urethane paint which greatly improves spray performance. 4030 also works as an inter-coat when applied over Auto Air Colors. Reduce 10% 4012 High Performance Reducer when applying 4030 as an inter-coat. 4030 DOES NOT PREVENT BLEED-THROUGH of candy2o into other candy2o colors. Use a catalyzed clear to lock candy2o when painting successive candy colors. 4030 appears milky in solution, dries clear. Colors dry satin finish when mixed with 4030. Read the reviews of our customers on AutoAir / Wicked / Createx 4030 INTERCOAT MIX ADDITIVE BALANCING CLEAR 120 ml of the category Createx auxiliary products. 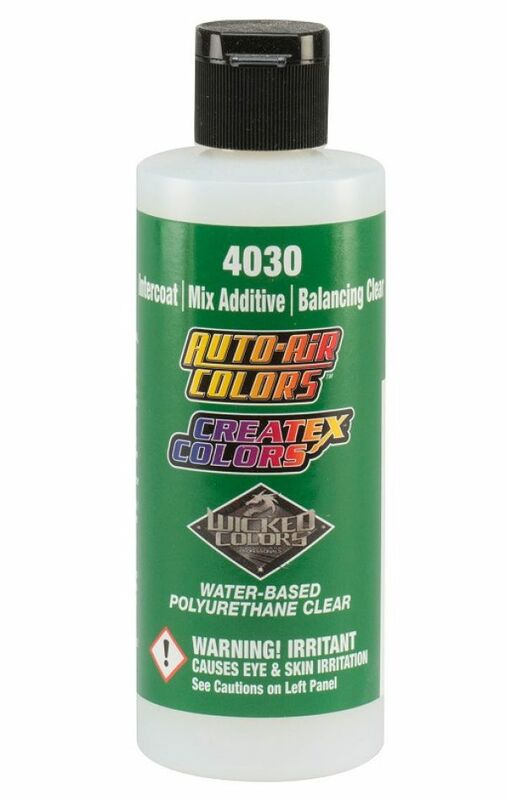 Review AutoAir / Wicked / Createx 4030 INTERCOAT MIX ADDITIVE BALANCING CLEAR 120 ml of the brand Createx. Trust in the quality and professionalism of Aerografando on the sale of AutoAir / Wicked / Createx 4030 INTERCOAT MIX ADDITIVE BALANCING CLEAR 120 ml, only from us you will find the best prices. You want to have more details on AutoAir / Wicked / Createx 4030 INTERCOAT MIX ADDITIVE BALANCING CLEAR 120 ml 4030 or more generally on ours Createx auxiliary products? You are looking for a Createx auxiliary products but do not you find it in the catalog? Staff of Aerografando will answer all your requests.